Killer Characters: Pumpkin Pie, Gratitude, and a Contest! Pumpkin Pie, Gratitude, and a Contest! I miss the Thanksgivings of my youth when close friends and family gathered around my mother’s table to share food and memories, and give thanks. But I try not to dwell on the missing part and focus on the fact that I am so grateful for these memories. They continue to lift my heart as the years roll on. My mother was known for two Thanksgiving dishes–chestnut stuffing and pumpkin pie, both of which I make every year. I manage, but they are never as good as hers. The pies are two inches thick and when you bite into a piece, the flavor grabs you. The thickness greatly enhances the flavor – there is simply more pumpkin to enjoy with each bite. It’s certainly not just the recipe that makes the flavor unique – Mom uses the Libby’s recipe that thousands of women use every year. There are a couple of changes – beside the thickness – she prefers the canned pumpkin, not the pumpkin pie filling, and she uses pumpkin pie spice, not separate spices. “That’s already in the spice mix,” she says. No matter how many recipes I try and how far I think I’ve come, I will always return to the recipe that really satisfies me. It’s just not Thanksgiving without it. This is the traditional holiday pumpkin pie, a classic recipe that has been on the label of Libby’s canned pumpkin since 1950. It’s an easy pie to prepare: Just mix, pour, and bake. My mother uses 2-inch-deep pie pans and doubles this recipe, filling the pie shells quite high. She says that the doubled recipe yields a pie and a half. Also, she does not use the spices called for here. She uses pumpkin pie spice and “some” cinnamon, calculating how much pumpkin pie spice she needs by adding up all the other spices called for – more or less. Mix sugar, cinnamon, salt, ginger, and cloves in a small bowl. Beat eggs in a large bowl. Stir in pumpkin and sugar-spice mixture. Gradually stir in evaporated milk. Pour into pie shell. Bake 15 minutes. Reduce temperature to 350 degrees F.; bake for 40 to 50 minutes or until knife inserted near center comes out clean. Cool on wire rack for 2 hours. Then serve or refrigerate. Top with whipped cream before serving, if desired. What about you? What dishes hold the warmest memories for you? I love pumpkin pie! Thanks for the recipe. Thank you for a fun contest and lovely giveaway. Too bad those of us who don't scrap book (but like characters who do) cannot participate. Good luck, crafty people. I agree - I'd love to enter, too! 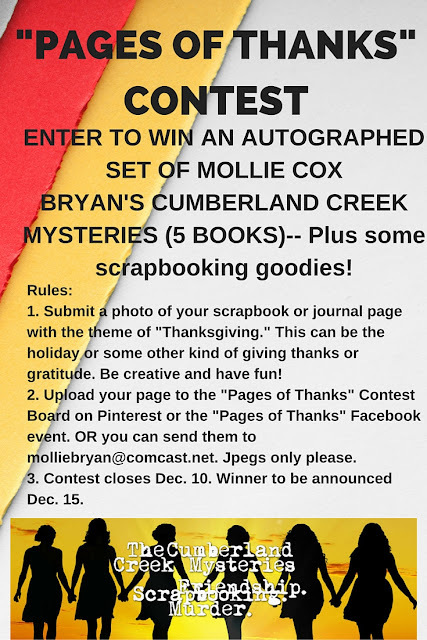 Ladies, you don't have to scrapbook to enter the contest. You can journal. You can collage. It's about expressing your gratitude on paper, not necessarily "scrapbooking." Cheers! I like to use the canned pumpkin (not pie filling) for many recipes - cookies, quick bread . . . . My best memories are when the turkey is in the oven as my mom and grandma would check it we would get a small plate of the delicious homemade stuffing. It's still my favorite part. I love pumpkin pie. I would love to win. I don't scrapbook, but enjoy your books. Sorry I can't enter. 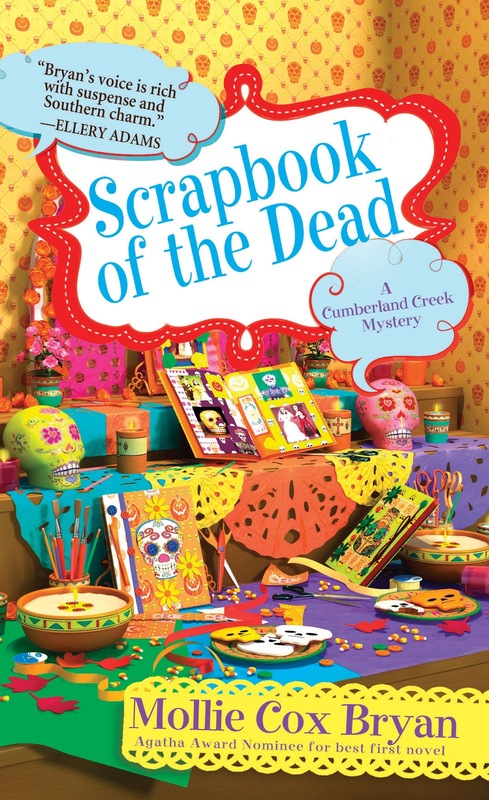 Would love to try your series, but I don't scrapbook. Oh, well. 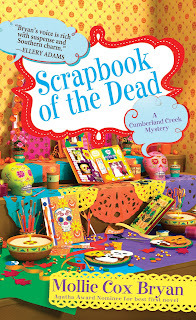 You don't have to scrapbook to enter the contest. You can journal. You can collage. It's about expressing your gratitude on paper, not necessarily "scrapbooking." Cheers! Thank you for giving us the chance to win. Happy Thanksgiving holiday weekend! Marilyn, you don't have to scrapbook to enter the contest. You can journal. You can collage. It's about expressing your gratitude on paper, not necessarily "scrapbooking." Cheers! For me, it's just not Thanksgiving without my mom's jell-o mold! Thanksgiving is best time of year for family, friends and very good eating.